Calcutta after the reintroduction of tram service to Balyganj. Acharya P.C.R. Rd. : Acharya Praphulla Chandra Roy Rd. B.B. 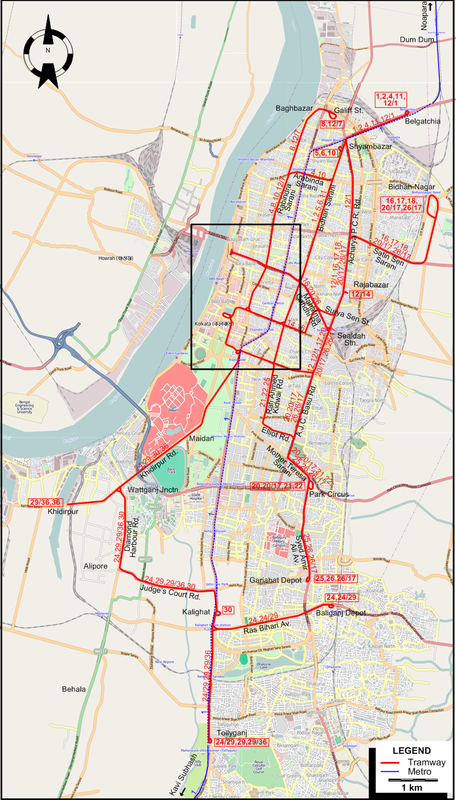 Gangopadhyay St.: Bipin Bihari Gangopadhyay St.
8 Binay Badal Dinesh Baag - Lalbazar St. - Rabindra Sarani - Baghbazar - Galiff St.
12/7 Esplanade - Hemanta Basu Sarani - Binay Badal Dinesh Baag - Lalbazar St. - Rabindra Sarani - Baghbazar - Galiff St.
Hemanta Basu Sarani - Old Court House St.
Electric tramways: 1902 - today. Underground (Metro): 24 Oct. 1984 - today. Tramways: originally 1000 mm, but from 1900: 1435 mm (standard gauge). Underground (Metro): 1676 mm (broad gauge [Indian standard on railways]). Claydon, G.B. "Calcutta revisited - Part 1: The present scene (administration, finance and traffic)", Modern Tramway & Light Rail Transit, Jan. 1982 (45: 529), p.10-18. Dean, R.N. 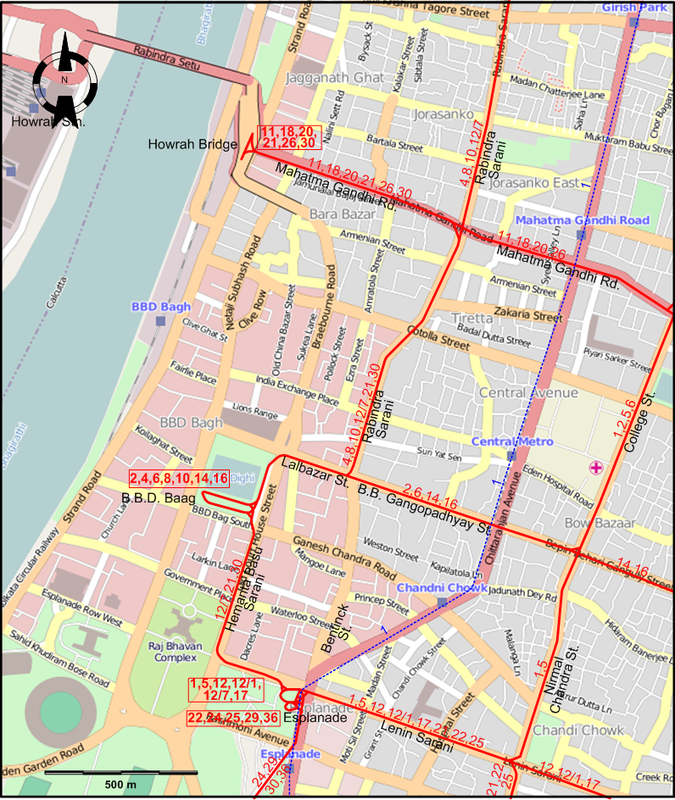 "Tramways in Calcutta today", The Modern Tramway, June-July 1945 (8: 90-91), p.41, 46, 49, 51. Runnacles, T.V. 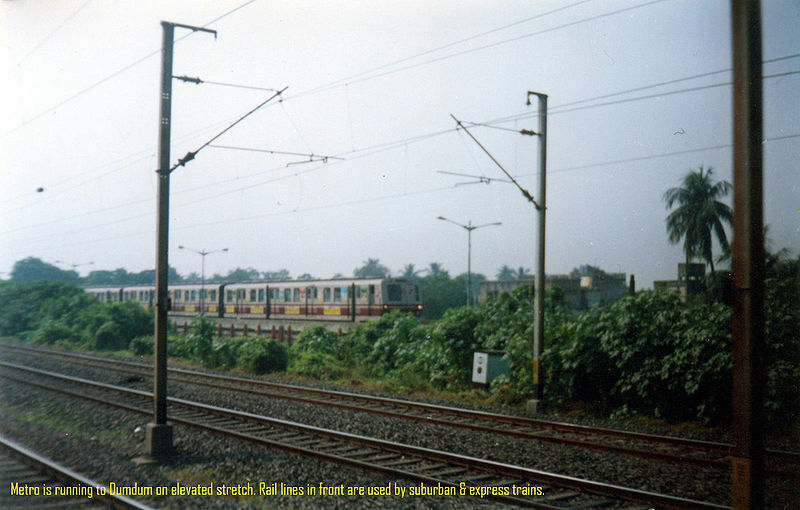 "Transport in Calcutta - Part 7: Aspects of tramway operation today", Modern Tramway & Light Rapid Transit, Feb. 1978 (41: 482), p.49-60. 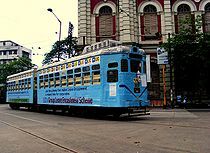 Russell, M. "Calcutta: Trams still thriving - but for how much longer", Tramways & Urban Transit, May 2006 (69: 821), p. 176-179. 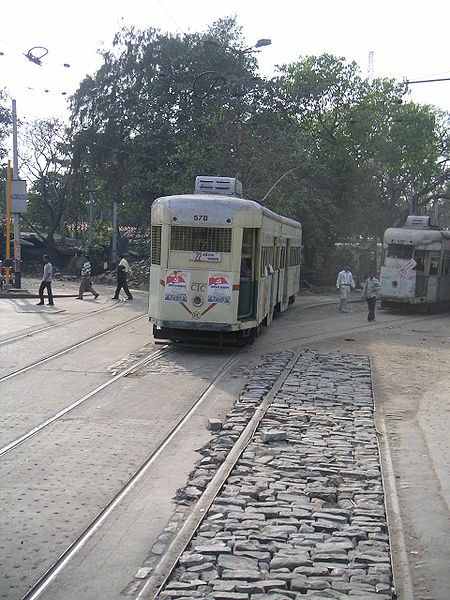 Russell, M. "Kolkata tramways: A modest revival? ", Tramways & Urban Transit, Aug. 2011 (74: 884), p. 321-324. Thanks to Ashis Mitra (from Kolkata, India) for the large amount of information he has kindly given me about the history of tramways in his city. He has also made corrections to pages I had already placed on my site. Thanks are also in order to Lars F. Richter (from Hamburg, Germany), who kindly sent me information on the new terminal arrangements at Binay Badal Dinesh Baag.